Our 8 hour course is designed to teach dog owners and dog professionals the knowledge and skills to respond to a sick or injured dog. Available as an in-person course or global eLearning. Our one-of-a-kind 3 hour workshop trains you how to respond like a lost dog investigator. We'll make effective flyers and posters and a 42-page Operation Find Fido™​ Handbook included. Our 2 1/2 hour follow-up workshop is dog-friendly and you'll be able to practice your skills learned in Dogsafe 101 but on your own dog, while under the supervision of your Dogsafe Authorized Instructor. Our 2 hour basic workshop is designed for busy dog owners who are looking for "need to know" topics such as prevention, vital signs, 3 health tests, head-to-tail assessments and more. It was a challenge to design eLearning programs that would keep our high standards -- but we did it -- and now you can learn in your pajamas with your dog at your feet. Available worldwide. Have you had a close call with your dog and ended up at a veterinary clinic spending lots of money? Dogsafe will save you money by teaching you how to conduct a head-to-tail assessment to compare what is a medical emergency requiring immediate veterinary intervention versus something that you can monitor at home. Dogsafe will also save you money by showing you how these head-to-tail assessments may help you identify abnormalities before they progress into something more serious, requiring significant veterinary care. Have you ever wondered how to apply your knowledge in human first aid to your dog? Dogsafe students have included nurses and paramedics and we can help you by teaching you the appropriate canine first aid techniques and other dog-friendly topics such as understanding canine body language and approach, restraint and transportation of an injured dog. Now I feel confident knowing that I can help out my canine friends if the need should arise. I wish I had taken the Dogsafe course sooner! Have you ever worried about an emergency involving your dog while camping, walking or just relaxing at home? Dogsafe will teach you how to prevent common injuries as well as apply first aid treatment to bone and joint injuries, puncture wounds, impaled objects, burns, environmental injuries such as heat stroke and hypothermia and more. You won't have to worry about the "what if" anymore, Dogsafe will give you peace of mind. Are you interested in learning everything you can about dogs? We share your enthusiasm! Dogsafe is a great way to learn about canine body language, taking vital signs, head to tail assessments and other common topics such as heatstroke, hypothermia, poisons, bandaging wounds and so much more. Your classes were very informative and the relaxed atmosphere made it so comfortable. Have you ever wondered how you'll react in an emergency involving your dog? Emergency situations can have huge negative effects on you, physically and psychologically, if you are not prepared. Dogsafe will teach you how to assess any emergency in 4 easy steps and this will give you confidence to act. Your dog is depending on you. Having this knowledge has definitely given me a confidence boost! I encourage everyone to take the Dogsafe course. Do you have a group of dog friends that are interested in learning canine first aid together? Perhaps you belong to a dog sport club such as agility, flyball or breed club? 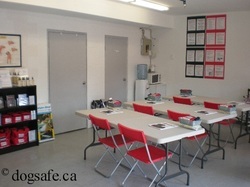 Many Dogsafe Authorized Instructors offer private group courses at your suitable location. Please contact a Dogsafe Authorized Instructor for details.